We offer a nice place to stay in Dubrovnik where you can fully immerse yourself in an authentic Dubrovnik experience. Hostel Villa Garden is conveniently located just a 5 minute walk from the Old Town. It is very easy to find, across bus stop at University of Dubrovnik. Numerous beaches are in walking distance. A great selection of restaurants, cafes and a grocery store are located nearby. Latest check in is 22:00 PM. Hostel Villa Garden offers private rooms with bathroom and kitchen (or access to a shared kitchen). A common room and terrace offer guests an opportunity to relax after a long day. All rooms have air conditioning, fridge, clean linen & towels. We look forward to sharing our beautiful location with you and making your trip a memorable one. If you have any questions about your trip, we are happy to assist you. Please contact me 20 minutes before arrival so I can meet you. IMPORTANT : Check in is no later than 10:30 PM. Please note that payment in cash is due upon arrival (Euro or Kuna). We Suggest you to print your booking confirmation. -Coupons for restaurants, 10% discount. -City map and event guide. -Luggage room available on arrival and departure. -Airport pickup can be arranged if requested, there is a 30 EUR charge for pickup service. If you want us to pick you up from the airport, please let us know in advance the flight number and arrival time by email or SMS . Numerous beaches very close to the property. Location is great, only a few minutes away to the entrance to old town. Staff were very friendly and very helpful. Rooms are clean and comfortable. I would 100% recommend for anyone looking to travel to Dubrovnik. I would rate it as quite good. In Dubrovnik two important priorities for me were being cheap, yet still close to old Town and having a cooking setup so I could prepare my own food (drubvonicks restaurant prices are impossible). Only booked at partial capacity, you were able to socialize your intimate room setting. The common rooms were also available but tended to be unoccupied. Owners are good people! Some minor complaints, it wouldn't hurt to give the furniture in the common room a deep clean. 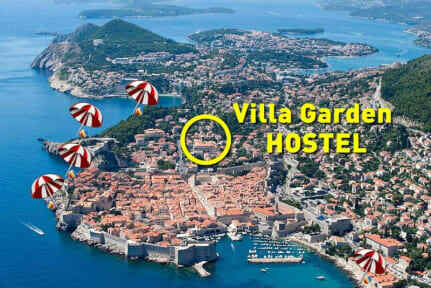 This hostel has a perfect location and is such good value for Dubrovnik! The hostel is half the price of most in the city. It is right beside a bus stop and only a 3 minute walk to the old town! The rooms are spacious (only 3 single beds in mine) and the bathrooms are good. Okay, it's not the most modern hostel and the kitchen isn't amazing but you can make do. This hostel is actually in a unique and charming garden, I guess the name should have clued me in. Close to the old city and an awesome swimming spot, it was a great place to stay in my short trip to Dubrovnik. Darko was a kind and helpful host. I know Dubrovnik is expensive , but The place is way overpriced!. 42 euros for a shared room , in an old room. Clean bed , but small tiny kitchen really dirty. Quite smelly . And no common spaces at all.